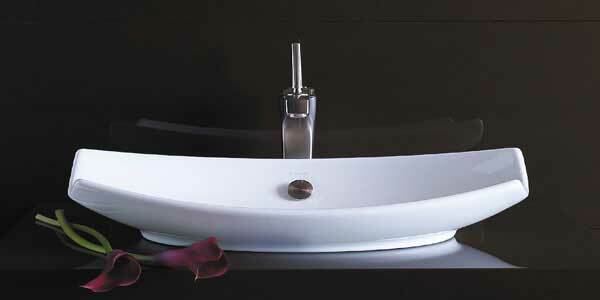 Pictures of a wonderful variety of shapes, sizes, colors and materials of vessel sinks for luxury bathrooms. Vessel sink is a top way to personalize a space. There is no specific rule to classify a certain bathroom design as a luxury bathroom, however, there is a approach to transform a bathroom makeover of any normal bathroom to a luxury bathroom by simply using high-end and unique bathroom fixtures. Installing a distinctive design fixture, such as a vessel sink, can achieve this luxury look in a master bathroom or powder room. Vessel sinks, a modern twist on the original bowl and pitcher of centuries past, sit on top of a counter or cabinet. These sinks come in a wide variety of styles and finishes which help to add an artistic quality to a luxury bathroom space. The main materials vessel sinks are available in are copper, glass, granite, marble, stone, and wood. Vessel sinks may be made from glass, beaten metal, porcelain and even stone. 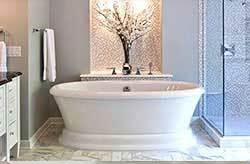 It is easy to choose a sink material that blends with the other objects and fixtures in the bathroom. The height of the bathroom vanity tends to be a bit lower with vessel sinks because they rest several inches higher than traditional bathroom sinks therefore your options for a luxury and unique cabinet for the vessel sink are endless. It is easy to convert a piece of furniture or even a table to hold a vessel sink. Many traditional sinks drop into the bath vanity counter, and traditional under-mount sinks will require a custom-cut countertop. 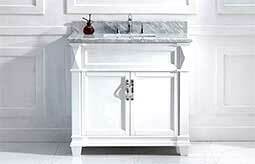 Alternately, a vessel sink can sit on top of the counter or piece of furniture. For vessel sinks there are wall-mounted faucets that feature a long spout for extended reach for adequate basin clearance. Wall-mounted faucets require a separate wall-mounted valve and drain for installation plus the sink should be deep enough to prevent water splashing on your floor or countertops. Beyond uniqueness and their distinctive design, vessel sinks also offer a few functional advantages for the luxury bathroom. Because the sink is raised off the countertop, overall bathroom clutter is level with or below the sink rim, not towering over it and in the way of your arms. Additionally, bowl-shaped vessel sinks actually free up countertop space directly under the sink rim. Lastly, vessel sinks are much better at containing splashes, making face and hand washing less messy. 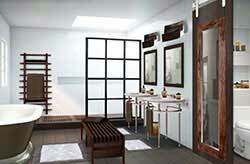 A nontraditional vanity with a vessel sink is one of the best ways that you can personalize your bathroom space. Sleek and contemporary, a rectangle vessel style sink features a wide, shallow basin and rounded edges in true minimalist fashion. Countertop installation ensures this sink will stand out in your bathroom as a striking focal point. Glass vessel sinks are not only visually appealing but are easy to keep clean; almost any common bathroom cleaner can be used. They are non-porous so they do not stain, and most are tempered making them quite strong and resistant to low impacts.